Are you looking for a great way to save money and spread the cost of your pet’s preventative health care? The Pet Health Club differs from pet insurance in that it is a payment scheme with discounts and savings for annual vaccinations, flea and worming treatment that pet insurance does not cover. Pet Health Club clients receive 10% off all our products and services! We encourage preventative health care and believe it is an important part of pet ownership to keep your pet in the best possible health, helping them live a happier, healthier and longer life. By signing up to our Pet Health Club you can make great savings on the annual costs of your pet’s preventative health care. Additionally we will reward your loyalty with exclusive Pet Health Club discounts on food, microchipping and give you a free 6 month health check with the veterinary surgeon in between your annual vaccinations. Simply download and print the application form – once complete, drop it off at reception. 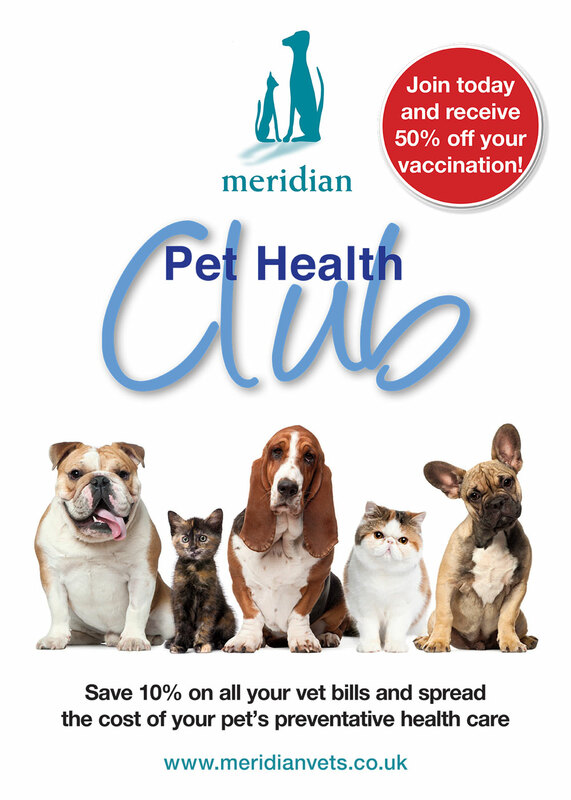 We cant emphasise enough how important it is to provide regular routine veterinary care and the Meridian Pet Health club will help you do so for an affordable fixed monthly cost. There is no joining fee or age restrictions and the monthly payments are collected by direct debit. Ask for an application form at reception or download here and we’ll get you started on a programme of affordable life long veterinary care for your pet.